SPECIAL MOTHER’S DAY OFFER: RECEIVE THIS VIDEO COURSE FREE WITH THE PURCHASE OF TELL YOUR TALE E-BOOK BUNDLE FOR $29.99. ADD BOTH TO CART AND USE PROMO CODE FREE4MOM. Since you’re on this page, I know that it’s important to you to preserve your family or personal story. I also know that there’s a pretty good chance that you wish you had more time to do so. Maybe you’re feeling overwhelmed trying to respond to all the writing and photo prompts to capture everything from birth to the present. I’ve been concerned about that “overwhelm factor,” and that’s why I’m really excited to share with you this video course on condensed life story writing. In it, I teach you how to focus on only 4 key questions to capture what matters most in your life story. 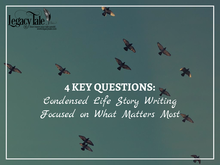 This video course comes complete with the following handouts and worksheets to guide you through the process of writing a condensed life story focused on what matters most. The video instruction is 35 minutes long, and using the information in it along with the handouts, you can answer the 4 key questions and write your story in record time. Think about it, life story curation for people who have a life! Using my 4 key questions method, you’ll find meaning in the past and joy for the future while leaving a legacy for those you love. I hope you’ll be as thrilled with this new writing process as I am! NOTE: Make sure you provide a good email address with your purchase. Then watch your email for the link to download. The download will be a single page document with embedded links for the video course and the five handouts.